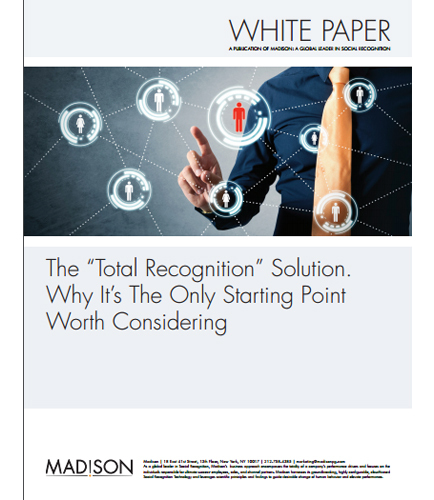 "Total Recognition Solution: Comprehensive guide to implementation"
This white paper makes the case for the “Total Recognition” solution–a more balanced and complete implementation philosophy that from day one will afford a comprehensive answer to enterprise recognition. It examines the contemporary role of some of the more common recognition concepts including service awards, above and beyond initiatives, peer-to-peer programs and President’s Awards, and outline how they work to motivate certain employee audiences. It highlights where those schemes are effective and also point out why those components alone fall short in their quest to appreciate, inspire and honor every employee’s contribution at key moments.